This article is about the type of Russian peasants. For other uses, see Kulak (disambiguation). Not to be confused with Gulag. The kulaks (/ˈkuːlæk/; Russian: кула́к, tr. kulak, IPA: [kʊˈlak] ( listen), plural кулаки́, "fist", by extension "tight-fisted"; kurkuli in Ukraine, but also used in Russian texts in Ukrainian contexts) were a category of affluent peasants in the later Russian Empire, Soviet Russia and the early Soviet Union. The word kulak originally referred to independent farmers in the Russian Empire who emerged from the peasantry and became wealthy following the Stolypin reform, which began in 1906. The label of kulak was broadened in 1918 to include any peasant who resisted handing over their grain to detachments from Moscow. During 1929–1933, Joseph Stalin's leadership of the total campaign to collectivize the peasantry meant that "peasants with a couple of cows or five or six acres more than their neighbors" were labeled "kulaks". According to the political theory of Marxism–Leninism of the early 20th century, the kulaks were class enemies of the poorer peasants. Vladimir Lenin described them as "bloodsuckers, vampires, plunderers of the people and profiteers, who fatten on famine". Marxism–Leninism had intended a revolution to liberate poor peasants and farm laborers alongside the proletariat (urban and industrial workers). In addition, the command economy of Soviet Bolshevism required the collectivization of farms and land to allow industrialization or conversion to large-scale agricultural production. In practice, government officials violently seized kulak farms and killed resisters while others were deported to labor camps. Another result of dekulakization was the mass migration of these "class enemies" from the countryside to the cities following the loss of their property as it was turned over to the collective as part of the collectivization campaign. 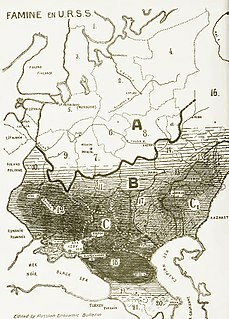 According to the Soviet terminology, the peasants were divided into three broad categories: bednyak, or poor peasants; serednyak, or mid-income peasants; and kulak, the higher-income farmers who had larger farms than most Russian peasants. In addition, they had a category of batrak, landless seasonal agriculture workers for hire. The Stolypin reform created a new class of landowners by allowing peasants to acquire plots of land for credit from the large estate owners. They were to repay the credit (a kind of mortgage loan) from their farm work. By 1912, 16% of peasants (up from 11% in 1903) had relatively large endowments of over 8 acres (3.2 ha) per male family member (a threshold used in statistics to distinguish between middle-class and prosperous farmers, i.e. the kulaks). At that time, an average farmer's family had 6 to 10 children. The number of such farmers amounted to 20% of all rural courts while their production level was reaching 50% of marketable grain. The land of the landlords had been spontaneously seized by the peasantry in 1917–18. A small class of richer peasants with around fifty to eighty acres had then been expropriated by the Bolsheviks. Thereafter a Marxist conception of class struggle led to an almost totally imaginary class categorization being inflicted in the villages, where peasants with a couple of cows or five or six acres more than their neighbors were now being labeled "kulaks," and a class war against them declared. During the summer of 1918, Moscow sent armed detachments to the villages in order to seize grain. Any peasant who resisted was labeled a kulak: "The Communists declared war on the rural population for two purposes: to extract food for the cities and the Red Army and to insinuate their authority into the countryside, which remained largely unaffected by the Bolshevik coup". A large-scale revolt ensued and it was during this period that Lenin sent a chilling telegram directive in August 1918 instructing the following: "Hang (hang without fail, so the people see) no fewer than one hundred known kulaks, rich men, bloodsuckers. [...] Do it in such a way that for hundreds of versts [kilometers] around the people will see, tremble, know, shout: they are strangling and will strangle to death the bloodsucker kulaks". During the height of collectivization in the early 1930s, people identified as kulaks were subjected to deportation and extrajudicial punishment. They were often murdered in local violence while others were formally executed after conviction as kulaks. Ownership of a mill, a creamery (маслобойня, "butter-making rig"), other processing equipment, or a complex machine with a mechanical motor. Systematic renting out of agricultural equipment or facilities. Involvement in trade, money-lending, commercial brokerage, or "other sources of non-labor income". By the last item, any peasant who sold his surplus goods on the market could be automatically classified as a kulak. In 1930, this list was extended to include those who were renting industrial plants, e.g. sawmills, or who rented land to other farmers. At the same time, the ispolkoms (executive committees of local Soviets) of republics, oblasts and krais were given rights to add other criteria for defining kulaks, depending on local conditions. In July 1929, it remained official Soviet policy that the kulaks should not be terrorized and should be enlisted into the collective farms. Stalin disagreed with this, saying: "Now we have the opportunity to carry out a resolute offensive against the kulaks, break their resistance, eliminate them as a class and replace their production with the production of kolkhozes and sovkhozes". A decree by the Central Committee was enacted on January 5, 1930 titled "On the pace of collectivization and state assistance to collective-farm construction." On 30 January 1930, the Politburo approved the dissolving of kulaks as a class. Three separate categories for the kulaks were designated: The first consisted of kulaks to be sent to the Gulags, the second was for kulaks to be relocated to distant parts of the Soviet Union (such as the north Urals and Kazakhstan) and the third to other parts of their province. As part of being forced onto collective farms, the peasantry were required to relinquish their farm animals to government authorities. Many peasants chose to slaughter their livestock rather than give them to collective farms. In the first two months of 1930, peasants killed millions of cattle, horses, pigs, sheep and goats, with the meat and hides being consumed and bartered. For instance, the Soviet Party Congress reported in 1934 that 26.6 million head of cattle had been lost and 63.4 million sheep. In response to the widespread slaughter, the Sovnarkom issued decrees to prosecute "the malicious slaughtering of livestock" (хищнический убой скота). In order to oust the 'kulaks' as a class, the resistance of this class must be smashed in open battle and it must be deprived of the productive sources of its existence and development. ... That is a turn towards the policy of eliminating the kulaks as a class. As Vasily Grossman explained, the activists who helped the State Political Directorate (the secret police) with arrests and deportations "were all people who know one another well, and knew their victims, but in carrying out this task they became dazed, stupefied [...] They would threaten people with guns, as if they were under a spell, calling small children 'kulak bastards,' screaming 'bloodsuckers!' [...] They had sold themselves on the idea that so-called 'kulaks' were pariahs, untouchables, vermin. They would not sit down at a 'parasite's' table; the 'kulak' child was loathsome, the young 'kulak' girl was lower than a louse". The overwhelming majority of kulaks executed and imprisoned were male, but precise numbers have been difficult to obtain. Stalin ordered that kulaks were "to be liquidated as a class" and this liquidation was considered by many historians[who?] to have resulted in the Soviet famine of 1932–1933. This famine has complicated attempts to identify the number of deaths arising from the executions of kulaks. A wide range of death tolls has been suggested, from as many as 6 million suggested by Aleksandr Solzhenitsyn, whereas the much lower number of 700,000 deaths are estimated by Soviet sources. According to data from Soviet archives, which were published only in 1990, 1,803,392 people were sent to labor colonies and camps in 1930 and 1931. Books based on these sources have said that 1,317,022 reached the destinations. The fate of the remaining 486,370 cannot be verified. Deportations on a smaller scale continued after 1931. The reported number of kulaks and their relatives who died in labor colonies from 1932–1940 was 389,521. Former kulaks and their families made up the majority of victims of the Great Purge of the late 1930s, with 669,929 arrested and 376,202 executed. Earth (1930), Ukrainian film by Alexander Dovzhenko, concerning a community of farmers and their resistance to collectivization. Earth depicts the social struggles between Kulaks and a youth who introduces a tractor to a Ukrainian village. ^ a b Richard Pipes (1 September 2001). Communism: A Brief History. Random House Digital, Inc. pp. 39–. ISBN 978-0-679-64050-9. Retrieved 7 January 2013. ^ a b c d Robert Conquest (1 March 2001). Reflections on a Ravaged Century. W. W. Norton & Company. p. 94. ISBN 978-0-393-32086-2. Retrieved 3 January 2013. ^ a b c d e f g Robert Conquest (1986) The Harvest of Sorrow: Soviet Collectivization and the Terror-Famine. Oxford University Press. ISBN 0-19-505180-7. ^ David Rubinstein (2001). Culture, Structure and Agency: Toward a Truly Multidimensional Sociology. SAGE Publications. p. 69. ISBN 978-0-7619-1928-5. ^ Comrade Workers, Forward To The Last, Decisive Fight! ^ McCauley, Martin. Stalin and Stalinism. ^ Kulaks (Korkulism) at the Ukrainian Soviet Encyclopedia. ^ Conquest, Harvest of Sorrow, p. 76. ^ Richard Pipes (1 September 2001). Communism: A Brief History. Random House Digital, Inc. p. 40. ISBN 978-0-679-64050-9. Retrieved 7 January 2013. ^ "On the characteristics of kulak farms subject to the Labor Code", Sovnarkom resolution, May 21, 1929, in: Collectivization of Agriculture: Main Resolutions of the Communist Party and Soviet Government 1927–1935, Academy of Sciences of the USSR, Institute of History, Moscow, 1957, p. 163 (Russian). ^ Lynne Viola; et al., eds. (2005). "The War Against the Peasantry, 1927-1930 : The Tragedy of the Soviet Countryside". Yale University Press. Retrieved 2018-03-26 – via ProQuest Ebook Central. ^ Robert Conquest (1987). The Harvest of Sorrow: Soviet Collectivization and the Terror-famine. Oxford University Press. p. 159. ISBN 978-0-19-505180-3. Retrieved 2 August 2013. 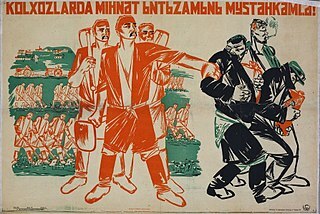 ^ "On measures against malicious slaughter of livestock", Central Executive Committee and Sovnarkom resolutions, January 16, 1930; November 1, 1930, in: Collectivization of Agriculture: Main Resolutions of the Communist Party and Soviet Government 1927–1935, Academy of Sciences of the USSR, Institute of History, Moscow, 1957, pp. 260, 336 (Russian). ^ Conquest, Harvest of Sorrow, p. 229. ^ Conquest, Harvest of Sorrow, p. 230. ^ Conquest, Harvest of Sorrow, p. 244. ^ Footnote on page 88 of book by Solzhenitsyn, Aleksandr (2005). H.T. Willetts, tr. One Day in the Life of Ivan Denisovich. Farrar, Straus and Giroux. ^ Solzhenitsyn, Aleksandr Isaevich, and Edward E. Ericson. "Chapter 2: The Peasant Plague." The Gulag Archipelago, 1918–1956: An Experiment in Literary Investigation. New York: HarperPerennial, 2007. ^ Perez, Gilberto (Summer 2011). "DOVZHENKO: FOLK TALE AND REVOLUTION". Film Quarterly. 64: 17–21 – via Performing Arts Periodicals Database. Look up kulak in Wiktionary, the free dictionary. Walter Duranty was a Liverpool-born Anglo-American journalist who served as the Moscow Bureau Chief of The New York Times for fourteen years (1922–1936) following the Bolshevik victory in the Russian Civil War (1918–1921).